My name has now changed – I think I am ‘The Dorset Scrambler’ ;)! 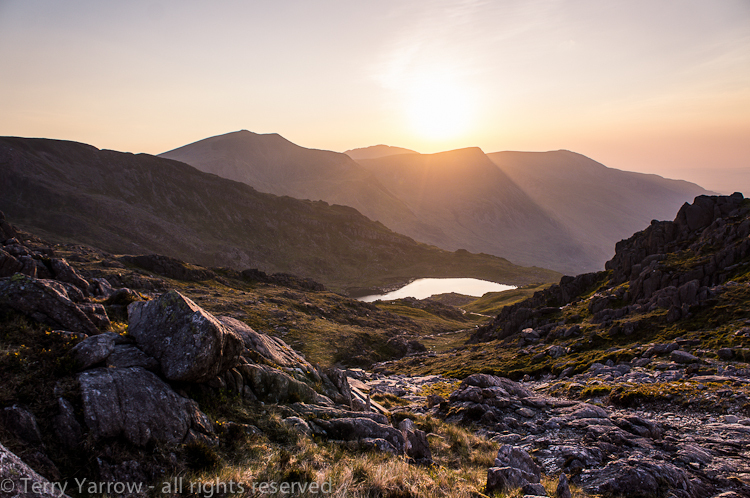 This was a great ramble up a mountain – well, not a ramble but more a scramble which I thoroughly enjoyed :)! And not in Dorset because Dorset has no mountains! 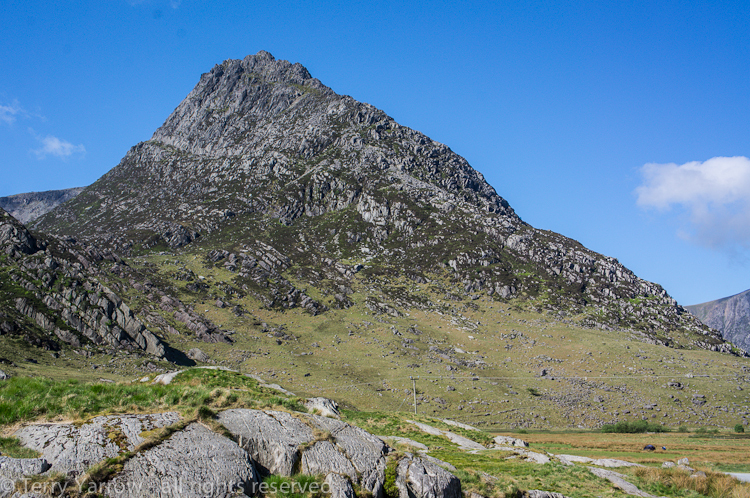 We have just returned from a week in Snowdonia, North Wales, and although it was a family holiday, I managed to escape for a couple of great walks, one around Mount Snowdon itself (blog coming soon) and one up a fabulous peak called Tryfan which I have wanted to climb for a long time. 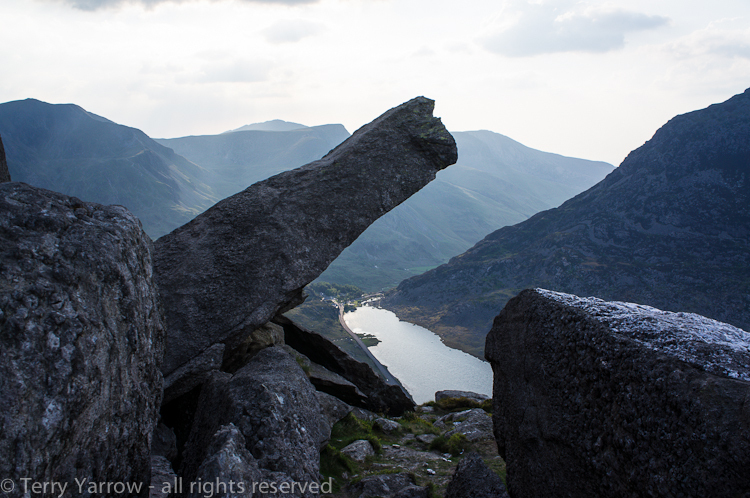 Tryfan is a fin shaped mountain in the Snowdonia Range and it stands at a little over 3,000 feet. Its name literally means ‘three peaks’ because………it has three peaks ;)! It is a popular mountain with many routes up of varying difficulty, and it is one I have wanted to climb for a long time. I chose to go directly up the North Ridge which is a long and for most parts a difficult scramble, in fact it verges on climbing in places. It is the ridge running upwards from right to left in the picture below. 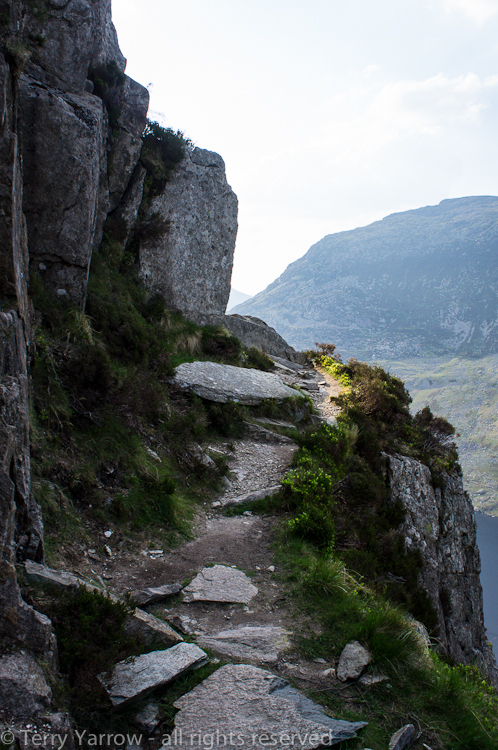 The route started in the beautiful Ogwen Valley and initially followed a fairly straight forward rocky path beside a dry stone wall but things quickly became more difficult when the path reached Milestone Buttress and skirted steeply round this (the Buttress itself is for climbers only!). 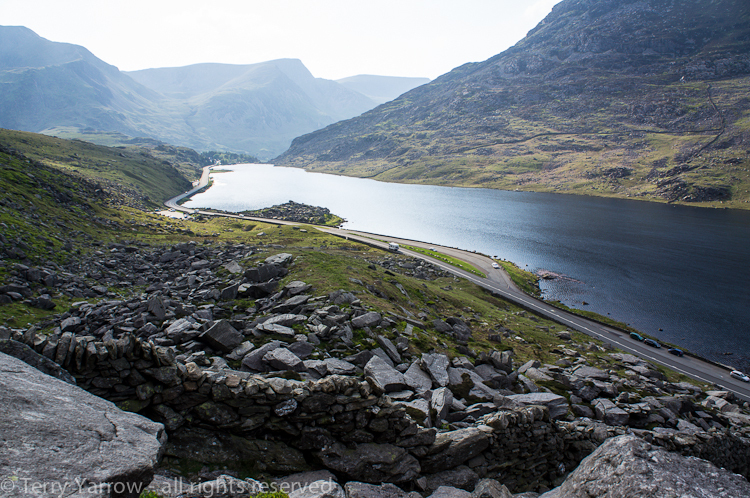 Even early on, the views on this ‘walk’ are spectacular as you look down on Llyn Ogwen. Something that added to the enjoyment of this walk was that I had decided to do it in the evening. Whilst this meant enjoying the evening sunset from the mountain top, it also meant that I had limited time to complete what is a 4 hour ‘walk’ – to be caught out up a strange mountain after dark with no torchlight would be somewhat difficult to say the least, but it added an extra dimension, a sort of extra level of adventure which I enjoyed. The route up was a mixture of slightly easier sections and some steep or near vertical sections which verged on climbing. I think the line between the two is a little blurred but generally scrambles cover ground which is less the vertical and where ropes are not required. I am blessed with being sure footed and having a good head for heights so was able to make quick progress but if you were someone who suffered from vertigo, you wouldn’t want to attempt this route! Part way up stands the Canon Rock, so called because it resembles a canon. It is of course traditional to have your photo taken standing at the end of the rock and who am I to break the tradition! The only thing was I was on my own! 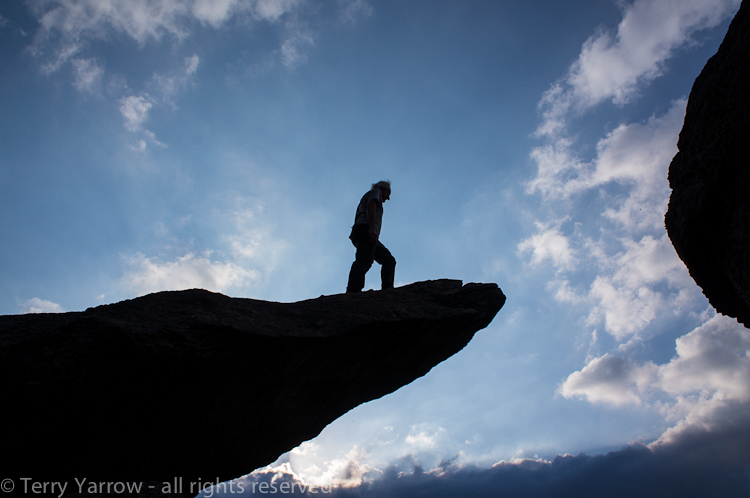 It must have been an interesting sight – resting the camera on the ground, setting the self-timer, and then climbing up to the base of the rock before running up the 45 degree angle to the top before the shutter fired. It took several attempts to get it right :)! It wasn’t the only traditional challenge on this route – the Leap of Faith was to come, but more of that later! 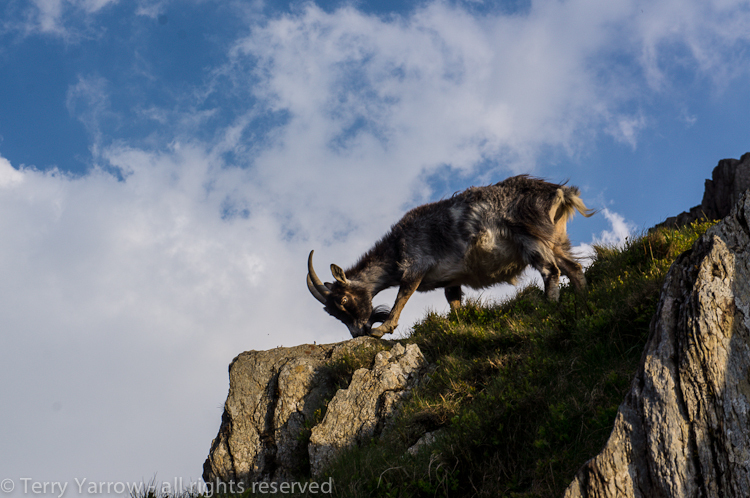 I say I was alone but I mean of course without human company – there was much wildlife for company, including a group of mountain goats that were foraging for food on the most exposed parts. After two hours of scrambling I finally reached the summit and the next challenge! At to top, there are two rocks approximately 3 metres high known as Adam and Eve and there is a gap of around 4 feet between them. 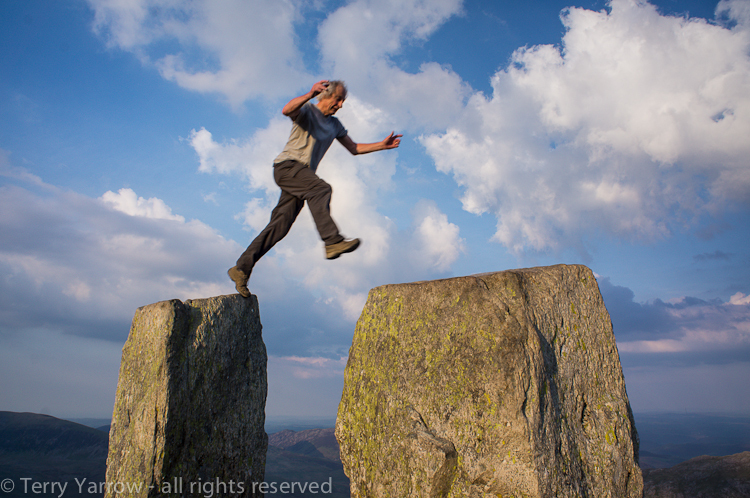 Tradition has it that anyone who can take the Leap of Faith between the two rocks receives the Freedom of Tryfan. Now a 4 feet jump between two rocks may not seem much at ground level but it is altogether more challenging when you stand on top and look down at the shear drop of hundreds of feet down one side particularly, and of course not forgetting the wind that whips across the mountain at 3,000 feet up! In fact, just getting up onto the top was difficult as there is very little in the way of hand or foot holds on either rock. The thought of doing it within the 10 seconds allowed by the self timer on my camera would have been an impossible challenge – but fortunately there were other people at the top and one kindly agreed to take a picture for me. But that added another challenge – I had to do it with people watching!!! With evening drawing in, everyone left to make their way down, leaving me alone on the summit. I have to say that it was a magical evening and it felt great sitting at the top of the mountain all on my own eating supper whilst watching the sun set! 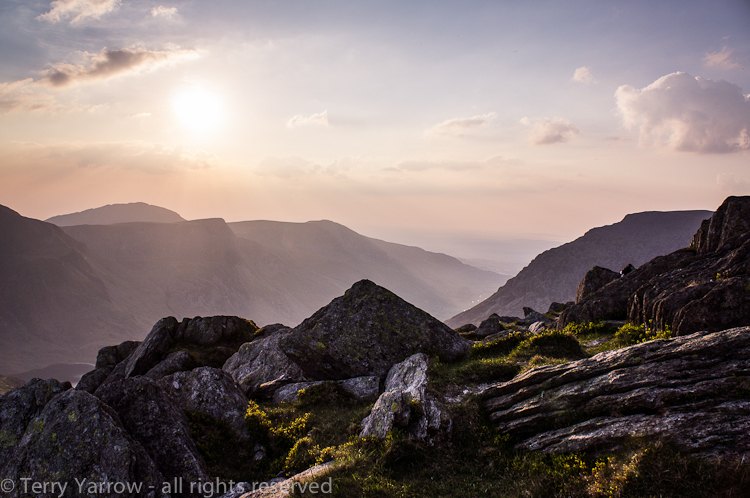 The view over the Ogwen Valley with the river, Afon Ogwen, snaking its way into the distance was just breathtaking! Not that I could sit there for too long as I didn’t want to run out of light (because it was a family holiday I hadn’t gone prepared with all the usual emergency equipment like head torches etc!). So I too headed down the south side of the mountain, past the south peak into Bwlch Tryfan, the col between Tryfan and its neighbouing peak of Glyder Fach. 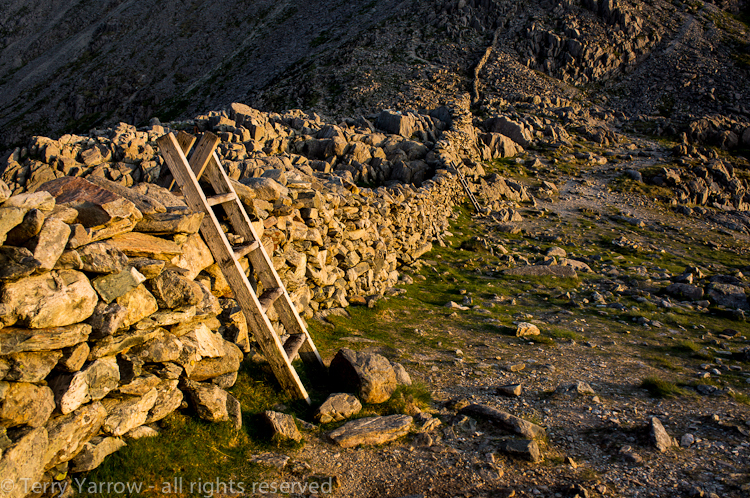 It always seems strange to me that even at the top of these passes there are dry stone walls with great wooden ladder stiles over them. It must have been quite a task building these walls as they snake their way up the mountainside! 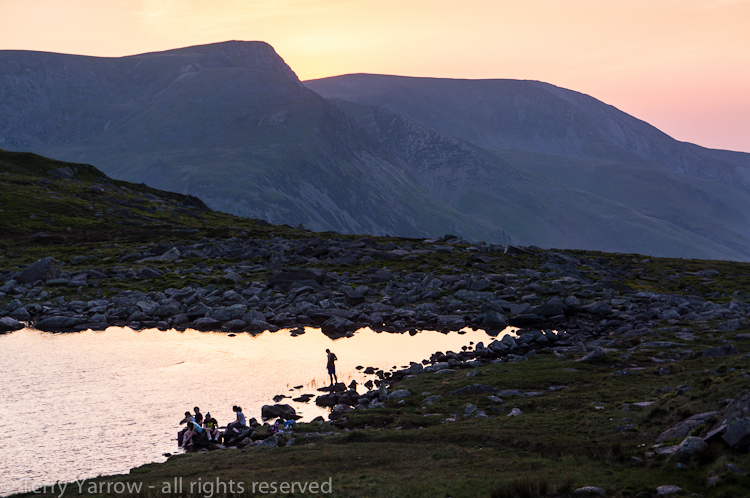 And then it was a very pleasant walk down through the valley as I watched the sun sink further towards the horizon, reflecting off one of natures mirrors – Llyn Bochlwyd. And when I reached the lake I overtook my summit friends who waved goodbye. 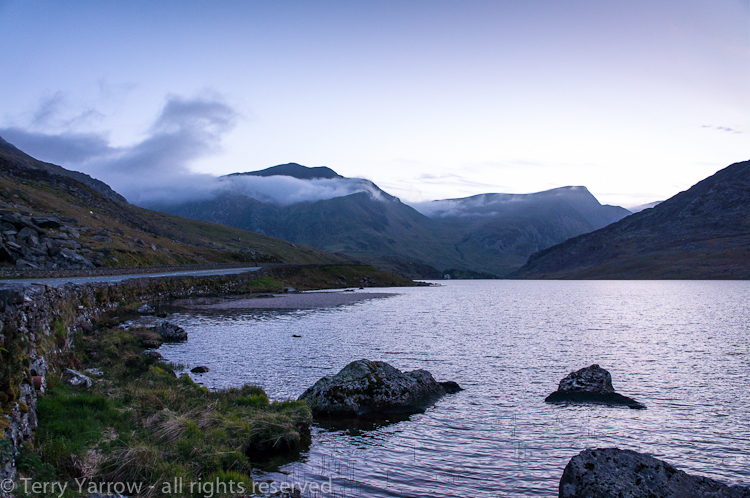 Finally after three and a half fabulous hours, I reached Llyn Ogwen again as the last light faded from the evening sky. It had been an amazing evening ‘walking’ in scenery which in many ways is in total contrast to Dorset’s rolling landscape, more rugged but equally beautiful. I was blessed with fabulous weather which is something which definitely doesn’t always occur in the Welsh mountains! Previous On walking backwards with cows and kestrels for company! You are amazing!!! I love the dry stone wall picture, and I absolutely adore the canon rock! I would’ve loved to take pictures of (and with) it! 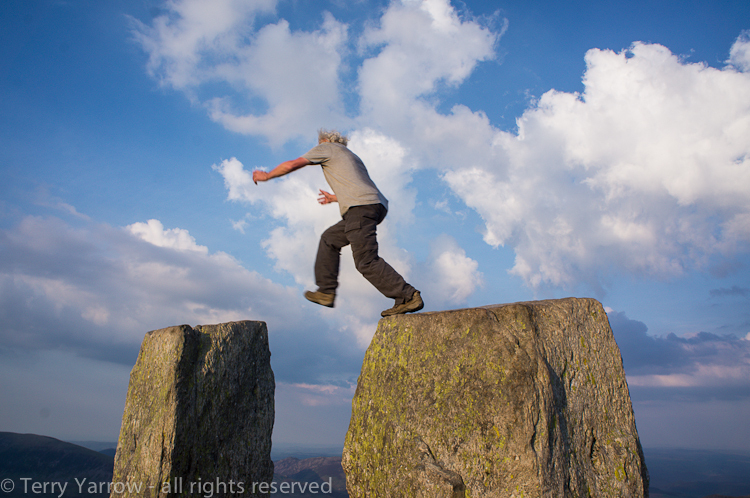 Your jump across the two rocks was indeed a leap of faith! I am in awe, couldn’t help but WOW out loud haha 🙂 As usual, beautiful pictures! What? Once was not enough?? You had to do it twice?!? How on earth does your wife handle your taking these kinds of chances at 3,000 feet?!!!? But, of course, the pictures were gorgeous as usual! Lovely. Although photo #3 is a bit unnerving — I definitely wouldn’t want to attempt THAT path after dark. Ha ha, no, it is a bit craggy! I can see King Arthur standing in many of those photographs and maybe a few Druids too.